The MedRez.net Scheduling Tool offers powerful functionality to help you create Annual Rotations Schedules (a.k.a. "block schedules", or "master schedules") quickly and without errors. 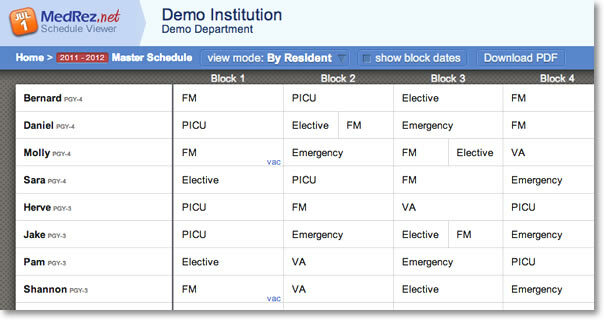 Split-table view allows you to see both the resident's schedules and the rotation rosters for each block simultaneously. Very flexible block dates let you deal with almost any situation. Vacation requests are entered by the residents through the online interface. Grant the vacations that work in the schedule and get warnings of conflicts with rotations that do not allow vacations. Set the number of blocks residents have to take for each rotation, and the number of residents needed in a rotation. The program then highlights the rotations that help meet these targets so you can make your schedules faster. Speed up the process of making Call/Shift Schedules by synchronizing them with a rotation schedule. The scheduling tool is set up to give you instant access to the information you need while making a block schedule so you don't waste any time. When a resident is put on a rotation in a given block, that rotation's list of residents is immediately updated. In many residencies most residents start on the first of the month, while interns start a few days later (or earlier). In this case the Scheduling Tool lets you create different Blocks for your interns. In other cases residencies might follow a weekly schedule with Rotations lasting anywhere from 2 to 6 weeks. The MedRez.net Scheduling Tool lets you create Blocks of varying lengths in one Schedule, and intermingle them in a Resident's schedule. Eliminate the tedious task of collecting each person's requests by taking advantage of the Scheduling Tool's online requests feature. Requests are displayed with each Resident's Rotation schedule so that you can immediately spot conflicts with Rotations that do not allow vacations. Track the number of times a resident is on a Rotation throughout their career using the Scheduling Tool's Rotations Tallies. Tallies are highly customizable so you can handle difficult situations such as Rotations that are split among multiple locations. The software helps you create your schedule by flagging the rotations that cause a conflict before you even assign a rotation to a resident. In the image below the rotation "Elective" shouldn't be used because we selected a full length block. Drag and drop editing does more than just take a Rotation and move it over. The Scheduling Tool can intelligently move other Rotations around to make room for the one you are dragging so that your Schedule remains sensible. Once your Block Schedule is done invite all residents and staff to view it online in a clear and readable page. More information about publishing online is available here. Once published, you may also create a hard copy of your schedule using the export to PDF function. PDF files (Adobe's Portable Documents Format) can be viewed on any computer and are great for printing, reviewing and emailing. Once you have created a block schedule you can easily start working on the Call/Shift schedule for a rotation. The program automatically adds residents to the appropriate blocks in the Call/Shift Schedule based on when they are on the rotation in the Annual Rotations Schedule. You can sync multiple rotations to the the same Call/Shift Schedule, and the block dates don't have to match.